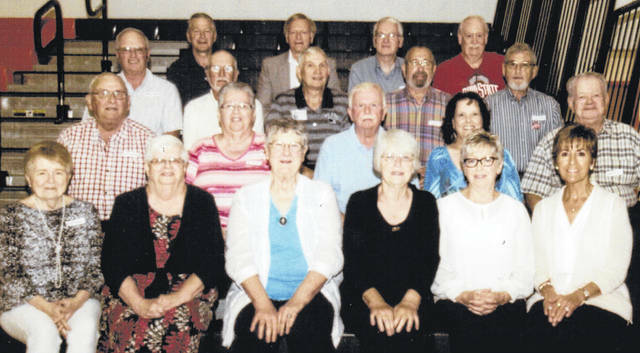 The West Liberty-Salem Class of 1963 held a 55-year reunion Sept. 1 at the school. Attending were, first row from left, Sue Markin, Becky Harrison Meyer, Sharon Eby Broshes, Nevora Fridenmaker Siegenthaler, Arzella Clark Harpest, Linda Legge Inskeep, second row, Phil Crabtree, Marsha King, Gary Haulman, Barbara Johnson Russell, Dewitt Evans, third row, Phil Neer, Phil Kimball, Jim McCullough, Phil Headings, David King, fourth row, Al Traucht, Tom Lehman, Mike Farley and Dennis Troyer. Teacher Wilbur Molitor also attended.